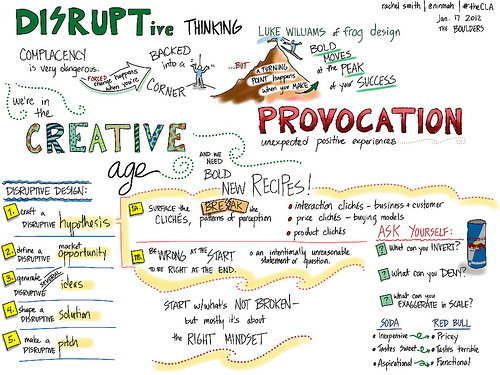 I’ve become intrigued by the idea of visual note-taking. I admit, I haven’t really tried it yet, but it’s something I want to explore. I’m no artist, but from what I have read and seen, this is one place where simple drawings and stick figures are more than acceptable. I’m looking forward to the session by Wesley Fryer at the Tablet Summit so I can take some time to play with this. From what I understand the session will involve both paper notetaking and notetaking on the iPad. As teachers we often ask our students to take notes, whether to act as a reminder of a talk they listened to, to highlight the key points in something they read or watched or to record questions to address later. We have certainly taken our share of notes. What do those notes mean to us when we look back at them? If we are very efficient, they sum up the talk or text. But they don’t often help us organize the information in a meaningful way. In addition, they are totally text-based which for many students is simply not their style! I know when I take notes in real time, I sometimes concentrate so much on the words I miss the meaning. By switching to images and relationships, I think concentration also shifts to listening for concepts. Our world is more and more visual. Students are used to learning through many forms of media. Why shouldn’t their notetaking reflect this? 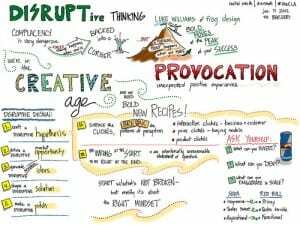 Visual notes that are done not in real time (i.e not while attending a live event, or watching a video at a specific time) can be quite beautiful, with careful attention payed to typography. I can picture students in a class creating visual notes about concepts in science class, for the characters and setting in a novel or about math concepts and those ideas are just off the top of my head. Remember that old adage: a picture is worth 1000 words? By creating visual notes, students are tapping into other modalities, other channels for learning, remembering and integrating knowledge as well as into their creativity. You can’t make it to Wesley Fryer’s session? Here is a link to his section on visual notetaking from Mapping Media to the Common Core. Thanks to Lynne Cazaly for giving permission to use her photo. I enjoyed crawling though her Flickr photostream. It has given me many ideas to integrate into my baby steps at visual notetaking. Thank you for the gentle nudge, and lots of great examples, I needed to try a move from text-based mind-mapping, my comfort zone, to include images. My visual notes will include lots of stick people and perhaps some drawings unrecognizable to others. To be honest, when I look back my own text-based notes after a meeting or presentation, sometimes I am not always sure what I meant. Hopefully, images would help add meaning and jog my memory. Do Board Games Have a Place in Education? Teacher Appreciation – There’s More to Teaching Than What Happens in the Classroom! Teacher Appreciation – Merci! Thank you! Les compétences transversales et les domaines généraux de formation : Les mort-nés du programme de formation de l’école québécoise ? Ma correction et la nouvelle orthographe: Comment ne pas pénaliser nos élèves injustement !